SS Peter and Paul Orthodox Church is located just five minutes from exit 8 of the Ohio Turnpike. Proceed north on Rt 57 (go past five lights), and turn right on east 32nd St. The Church is located at the end of the first block. 4:00 PM Vespers followed by Confessions. 9:00 AM Hours; 9:30 AM Divine Liturgy. Church School. Following the veneration of the Cross, join us for a coffee and Social Hour in the Church Hall. 5:30 Confessions; 6:00 PM Liturgy of the Presanctified Gifts, followed by Lenten bread and soup supper. (WEDNESDAYS ONLY). 6:00 PM Vespers, blessing of bread, wheat, wine & oil, followed by Confessions. 8:30 AM Hours and Confessions. 9:00 AM Divine Liturgy. For a complete schedule of services, please visit the Monthly Calendar on the parish website. Please call the Rectory at 440-277-5281 for schedule of other services, or to arrange Baptisms, Marriages, Memorials (Parastas), Thanksgiving Services, etc. Since 1913, the parish community of SS Peter and Paul has always opened its doors to all people who are seeking meaning to their lives, struggling together in this earthly pilgrimage of life. 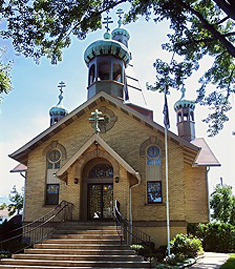 Historically, the parish is considered the “Mother Church of Orthodoxy in Lorain, Ohio,” aiding to other Orthodox Churches in the City. What makes this parish community unique and distinguishable today is the diversified cultures of its faithful. A beautiful tapestry united in the Holy Orthodox Church, underscores its intimate link with its origin, which can be traced back to the arrival of eight Orthodox Missionaries to Alaska in 1793.